Beginning on August 24, 1572 and lasting for nearly two months afterward, tens of thousands of men, women and children were slaughtered across France as part of an ongoing war to decide whose Jesus was right. Although simmering for years, all hell broke loose in Europe after Martin Luther nailed a long list of complaints about Catholicism to the door of Castle Church in Wittenberg, Saxony on Halloween night, 1517. There was nothing unusual about a priest doing this. It was a common way for the clergy to propose points of debate among themselves to be further discussed in person at a later date. What made this instance different from all the other papers nailed to church doors is that someone translated the words from Latin into German. Most commoners couldn’t read Latin, but some could read German. Once translated, the contents of that thesis spread like wildfire. Often cited as the spark of the Protestant Reformation, this act set off a series of religious wars between and within nations. Protestantism had already made strong inroads in France by the middle of the 16th century, with many following the teachings of Martin Luther and John Calvin. Calvin was a native of France who had fled persecution but had found a home in Switzerland from which he published religious treatises such as Institutes of the Christian Religion and Ecclesiastical ordinances. Popular, particularly with the nobility, Calvinism soon took hold in France thanks to the help of the Bourbon Prince of Condé and Henry of Navarre. Nonetheless, the French monarchy remained staunchly Roman Catholic. As Protestants became increasingly bold with actions like the Affairs des Placards, and the printing and distributing of Calvin’s and other Protestant treatises, the French monarchy ratcheted up persecutions. By 1560, the Huguenots’ numbers had grown, and a few aristocratic Protestants had hatched a failed plot to wrest power from the Catholics, known as the Conspiracy of Amboise. At the same time, the practice of destroying Catholic icons in churches (iconoclasm) increased significantly. In addition, by the end of this year, the child Charles IX became King of France, but under the control of his mother Catherine de’ Medici. Three wars followed this ascension – the first (1562-1563), second (1567-`568) and third (1568-1570) – and each of these was accompanied by skirmishes, battles, massacres, assassinations and general unrest. For the Catholics, notable participants included the Dukes of Guise (Francis and Henry), Antoine de Navarre (not to be confused with Henry) and Henry III, Duke d’Anjou. On the Protestant side, bigwigs included Henry of Navarre, the Prince de Condé, Admiral Coligny, William of Orange, and the Duke of Zweibrücken. The third war ended with the Peace of St. Germain in August 1570, although tensions remained high and occasional massacres of Huguenots continued to occur throughout France. To address the unrest, Catherine de Medici arranged for a marriage between her Catholic daughter, Marguerite de Valois, and the Protestant, Henry of Navarre, in Paris on August 18, 1572. The glitterati of the Protestant movement were all assembled in Paris for the wedding and believed they were safe, as per the Treaty of Saint Germain. Experts disagree on who ordered what, but shortly after Henry and Margaret wed, tensions skyrocketed. One of the most powerful Protestant leaders was Admirial Gaspard de Coligny, and on August 22, 1572, while he remained in Paris celebrating the royal wedding, an attempt was made on his life. According to some, this was part of a conspiracy by Catherine and others to “do away with five or six heads no more,” and thus end the “civil discord” that had riven France for the preceding 10 years. [Catherine] learned . . . that the Huguenots had decided to . . . avenge Coligny’s attempted murder by marching on Paris; she knew that the Catholics were preparing to defend themselves, and she foresaw that between both parties the king would be alone and powerless . . . . 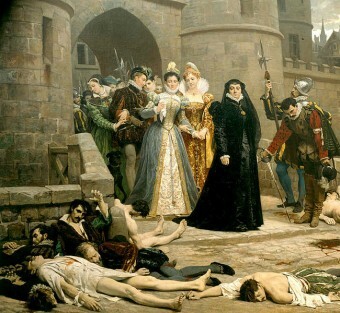 The threats of the Huguenots and her son’s consternation impelled Catherine to try to avert this civil war by organizing an immediate massacre of Protestants. It was because the attack made on Coligny, 22 August, had failed that Catherine conceived the idea of a general massacre. . . . [which] arose in Catherine’s mind under pressure of a sort of madness; she saw in this decision a means of preserving her influence over the king and of preventing the vengeance of Protestants, who were exasperated by the attack made on Coligny . . .
Good God! Since you deem it well to kill the Admiral, I agree, but all the Huguenots in France must likewise perish, so that not one be left later to upbraid me. Who was put in full command of the enterprise [and] summoned by night several captains . . . and some commanders . . . and told them that it was the will of the King that, according to God’s will, they should take vengeance . . . . The signal to commence the massacre should be given by the bell of the palace, and the marks by which they should recognize each other in the darkness were a bit of white linen tied around the left arm and a white cross on the hat. Besme [one of the Duke of Guise’s men] gave him a sword thrust through the body, and having withdrawn his sword, another thrust in the mouth, by which his face was disfigured . . . . Then the Duke of Guise . . . made the inquiry and they threw [Coligny’s] body through the window into the courtyard . . . . After [Coligny’s] body had been treated to all sorts of insults . . . [they] finally cut off his head, which they sent to Rome. [Many] battered in the doors of the Huguenot houses . . . [and] on the following morning blood flowed in streams; the houses of the rich were pillaged regardless of the religious opinions of their owners. [In] twelve cities which did experience a massacre . . . there had once been significant Protestant minorities, and which in some cases had actually been taken by Huguenot forces in previous wars . . . [where] Catholic majorities felt keenly the threat of religious pollution. To escape death, both Henry of Navarre and the Prince of Condé briefly converted to Catholicism until they escaped Paris. Estimates on the number of Protestants killed by the time the slaughter ended sometime in October 1572 range from 2,000 to 70,000.
buddy I think you know that was 500 years ago right? things have changed and the catholic church has changed a lot… so please dont say any crap. Muslim is a great religion by the way they’re principals are beautiful, now what the people have done may not be so nice… if you think that way christians (american military) have killed a lot more so you’re say Christianism is bad.